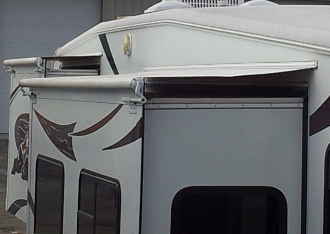 Sun Wave, Slide-Out replacement fabric will keep the debris and elements off the slide out and out of your RV. Our Slide-Out Cover is as durable as our patio fabric, and white in color to help reflect heat from the sun on hot summer days. Sun Wave, Slide-Out cover is as strong and durable as our patio awning fabric. Sun Wave, Slide-Out cover will fit any A&E (Dometic) and Carefree slide topper without a metal cover. Fabric is 16oz, 1000 denier strength, white in color, poly cord size is 1/4″ at rail and 1/8″ at tube. Poly cord is heat welded to give a stronger hold on the poly cord. The heat welded poly cord also resists tearing and ripping of fabric at top and bottom, along with protecting from leaking in stitching lines. 66", 88", 110", 132", 154", 176", 198"